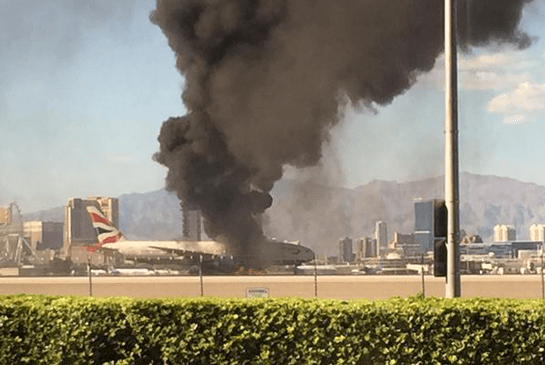 LAS VEGAS (AP) — A fire happen on a plane at the McCarran Ariport of Las Vegaas. The plane’s engine of a British Airways jet caught fire while the plane was preparing to take off from Las Vegas. All the passenger are safe and alive. Only 14 of them were transported to the Hospital with minor injury. 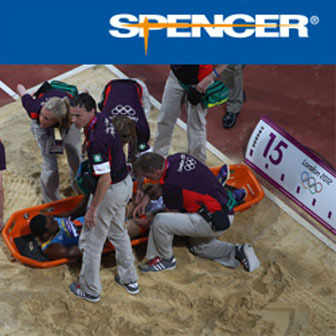 Passengers escape with the standard emergency exit. Billowing black smoke and orange flames could be seen pouring from under the plane’s wings, sending passengers fleeing quickly from the aircraft and across the tarmac before about 50 firefighters doused the aircraft in minutes. British Airways said late Tuesday that 157 passengers, not 159 according to earlier reports, were on board Flight 2276 in addition to 10 crew members and three pilots when the engine caught fire. All were able to get off the plane, McCarran International Airport spokesman Chris Jones said. Fire officials said 14 people were taken to Sunrise Hospital by early Tuesday evening for minor injuries, most a result of sliding down the inflatable chutes to escape. The Federal Aviation Administration delayed flights to Las Vegas from some airports for more than two hours after the fire to slow the flow of planes while the disabled Boeing 777 made two of the airport’s four runways inaccessible. One of the runways reopened about 2 1/2 hours after the fire. “Everyone ran to the windows and people were standing on their chairs, looking out, holding their breath with their hands over their mouths,” Bügmüncher said. The plane’s emergency slides were deployed a few moments later and passengers quickly got off the plane. She said it was a “bit more orderly” than she would have expected given the dramatic nature of the fire and smoke. Firefighters stationed at the airport reached the plane two minutes after getting reports of flames, and within another three minutes, everyone inside the plane had escaped. After firefighters extinguished the flames, emergency vehicles could be seen surrounding the aircraft, which was left a sooty gray from the smoke and fire retardant. Federal Aviation Administration spokesman Ian Gregor said the left engine of the twin-engine plane caught fire. The National Transportation Safety Board was collecting information about the incident, said Eric Weiss, a spokesman for the agency in Washington. Clark County Deputy Fire Chief Jon Klassen said the cause of the fire wasn’t clear yet, but the fire didn’t appear to breach the cabin. The Boeing 777-200, popular with airlines for its fuel efficiency for long-haul flights, was bound for Gatwick Airport near London. In its 21-year history, the 777-200 has been involved in three fatal incidents: one in July 2013 that killed three passengers when an Asiana Airlines flight landed short of San Francisco International Airport’s runway; Malaysia Airlines flight MH370 that disappeared last year, and a piece of its debris was recently recovered on an Indian Ocean island; and Flight MH17 that was shot down over Ukraine. Titmuss said in an email that the airline was “looking after customers” but didn’t elaborate. She said the airline would release more information later. Las Vegas’ airport is the ninth-busiest in the U.S. and had nearly 43 million passengers last year. The airport has been taking steps to accommodate more international travelers seeking direct flights to Europe and Asia, including adding new gates to accommodate wide-body double-decker jets.